Nine-year-old chess champion Lara Mallin with her trophies. ‘…she the under-10 girls champion of Middlesex, her latest crown claimed on Sunday last week, but she also holds the Hertfordshire and Barnet titles for her age group. Lara.. said: “My dad taught me when I was two and I have been playing tournaments for about a year now. It’s been a sharp rise for the youngster, with the Middlesex win coming almost a year to the day after she entered her first tournament last November. Wes Darling, Max Peters, Douglas Ward, and Nathan Palmisano. 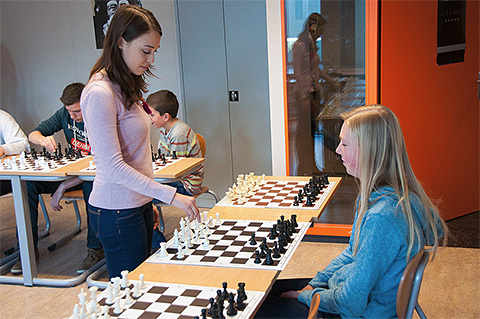 ‘The Royal Dutch Chess Association organizes so-called chess challenges at secondary schools throughout The Netherlands. 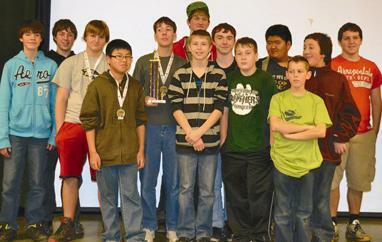 The challenge is that you can learn how to play chess in one lesson of 45 minutes. The lessons are taught by experienced chess trainers like Dolf Meijer, Arlette van Weersel, Pascal Losekoot and Franck Steenbekkers.